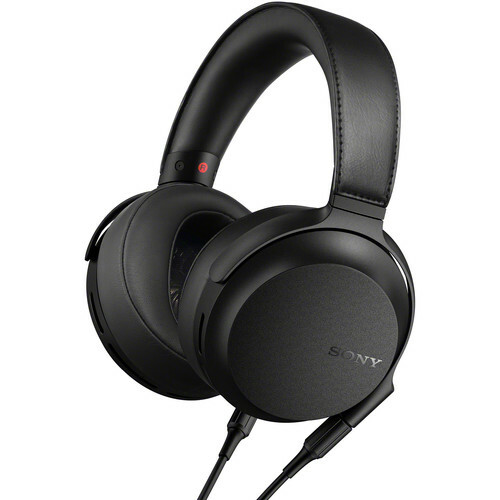 The MDR-Z7M2 Circumaural Closed-Back Headphones from Sony features 2.76" HD drivers, aluminum-coated liquid crystal polymer diaphragms, Fibonacci-patterned grilles, and large neodymium magnets, allowing you to lose yourself in the music you love. They can be used to enjoy enhanced sound quality and reproduction of three-dimensional, spatial sound with hours of listening comfort. The MDR-Z7M2's drivers are designed to cover your ears and produce a plane wave front, which is like that in a natural sound field. The frequency response is 4 Hz to 100 kHz, making every note sound clear across the sound stage. Other features include a smoother high-frequency response, ergonomic earpads, and silver-coated oxygen-free copper cables. Two detachable Y-type cables are included: a 9.84' cable with a gold-plated 3.5mm stereo mini plug, and a 3.94' silver-coated cable with an L-shaped, gold-plated 4.4mm balanced standard plug. By digitally capturing music at a higher rate than CD, High-Resolution Audio allows you to get closer to the original studio recording and enjoy your music just as the artist intended. With a newly developed magnetic circuit and bigger magnet (double the size of the MDR-Z7), the MDR-Z7M2 establishes more driving power and a fast response to high-resolution signals, which results in sharp clarity of sound. A combination of three-dimensionally sewn synthetic leather surfaces and very thick low-repulsion urethane foam cushion provides an ergonomic shape to fit to the unevenness of the head and gives even pressure throughout the area. This reduces sound leakage by increasing the air-tightness and delivers a natural, heavy bass. The large diameter 2.76" HD drivers are designed to cover most people's ears, producing a plane wave front like that in a natural sound field, and reproduce frequencies from 4 Hz to 100 kHz. Every note stays precise and clear across a spacious sound stage, reproducing the emotion and energy of the original recording, with true vocal clarity and precise bass response. Enjoy clear, precise, and dynamic sound with a 4.4mm balanced connection cable, which separates left and right sound signals and reduces noise from the output signal. Silver-coated, oxygen-free copper cables minimize resistance and signal-transmission loss. The result is less sound degradation, finer detail, and smoother treble sounds. The Fibonacci-patterned grilles inherited from the MDR-Z1R reproduce the intended sound properties smoothly. They are made of stiff resin to achieve both thinness and strength and minimize sound damping from the grilles at ultra-high frequencies. Aluminum alloy is used for hangers and sliders that form the backbone of the headphones. They are both lightweight and ensure long-lasting durability over the years. Box Dimensions (LxWxH) 9.1 x 8.5 x 4.9"
where is manufacture which country ? This product is currently made in Thailand.